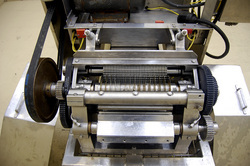 URSCHEL Model M DICER / STRIP CUTTER / SHREDDER. 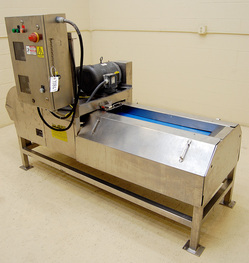 A two-dimensinal cutter manufacturer rated for dicing, strip cutting, or shredding a variety of products no more than one inch (25.4mm) in thickness, including bread, beef, pork, poultry or fish, bacon, fruit leather, bread, eggs, pork skins, etc, through a wide temperature range from fresh chilled to hot cooked. High volume throughput in the tons per hour range depending on product, for example, manufacturer rates for approximately 6,500 lbs per hour cutting "poultry" (i.e. chicken). Manufacturer cutting specifications are identical to the Urschel Model M3 and Urschel Model M6, with cutting parts available in a range of cut sizes, for circular knife cuts from 3/16 to 1.5 inches (4.8mm to 38mm), and crosscut knife cuts from 1/8 inch to 3 inches (3.2mm to 76.2mm). The manufacturer also offers special special gearing for crosscuts up to 5.66 inches (144mm). This Urschel M cutter is presently set for 3/4 inch dices, with 3/4 inch crosscut spindle, circular knife spindle, and stripper plate. The existing 1/4 inch feed drum and feed roll accommodate the current 3/4 inch setup, as well as other sizes divisible by 1/4 inch. 1/4 inch and 1 inch stripper plates. An additional crosscut spindle for 3" cuts. Circular knife spindles for 1/4 inch, 1/2 inch and 1 inch. 9.5 inch wide by 36 inch long infeed belt at a 29.5" infeed height. A factory electrical control panel with safety interlock system controls the 3HP 230/460 volt 3 phase drive. As of this writing, this strip cutter / shredder / dicer is in stock in good operable condition, and available for immediate shipment as-is. This page contains a single entry by Michael C. Shults, Alard Equipment Corp published on August 6, 2013 11:27 AM. y1309 was the previous entry in this blog. y1726 is the next entry in this blog.